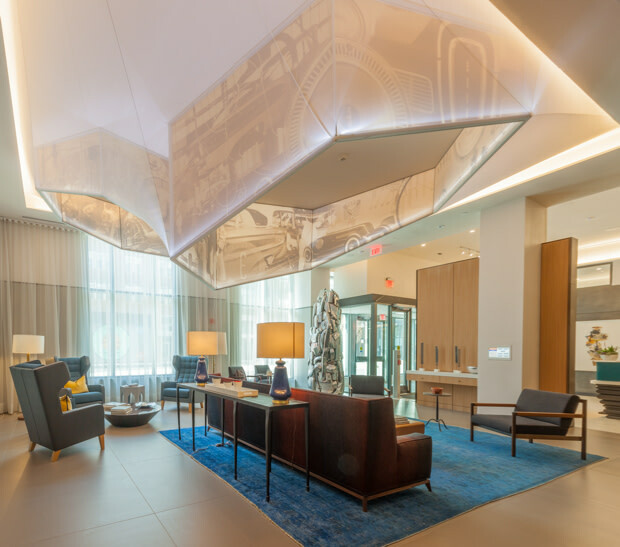 Planeta Design Group approached Transformit with several sculptural images from magazines as the foundation of ideas for a light fixture to be designed for the lobby of the Montaje Apartments, a new construction project located at Assembly Square in Somerville, Massachusetts. 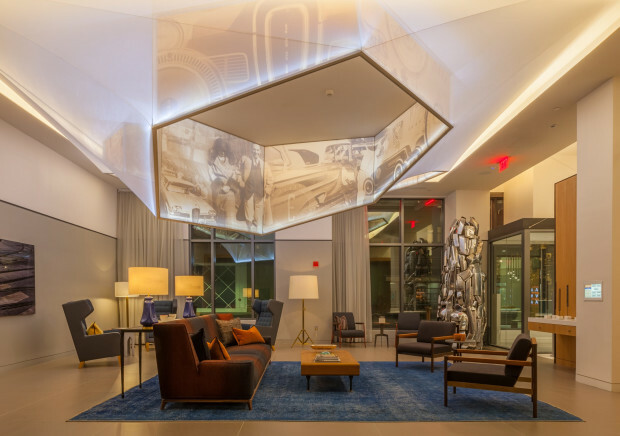 The light fixture needed to fit in a 20’ x 25’ coffer and Planeta envisioned a luminaire that used fabric to create a semi-transparent, light and airy feeling, and used historical photographs from the site’s days as a Ford Motor Company assembly plant to create a piece of site-specific art. The Montaje Apartments are located adjacent to Assembly Row, a new development on the former site of a Ford Motor Company assembly plant. The design theme in and around the building involves hexagons incorporated in graphics, signage, building features, and sculptures. 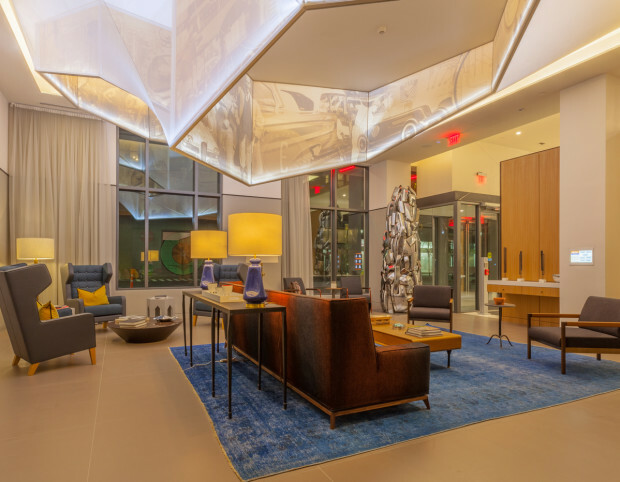 Planeta Design Group set out to create a luminaire that was functional, beautiful, and aesthetically aligned with the building’s contemporary style, yet artistically rooted in the site’s history. With Planeta leading the design process and Transformit the engineering and fabrication elements, the two creative shops collaborated to design this luminaire comprised of three hexagons of varying size and orientation suspended from the ceiling and sliced at varied angles and elevations. 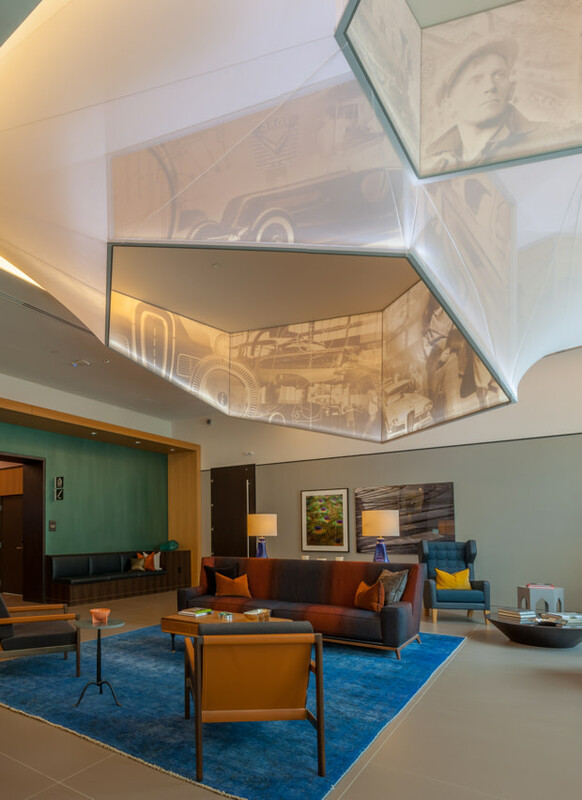 The sidewalls of each hexagon are stretch fabric printed with historical photographs, curated by Seattle-based firm Foreseer, of the automobile assembly line, buildings, people, and fashion from the Edsel Ford era. 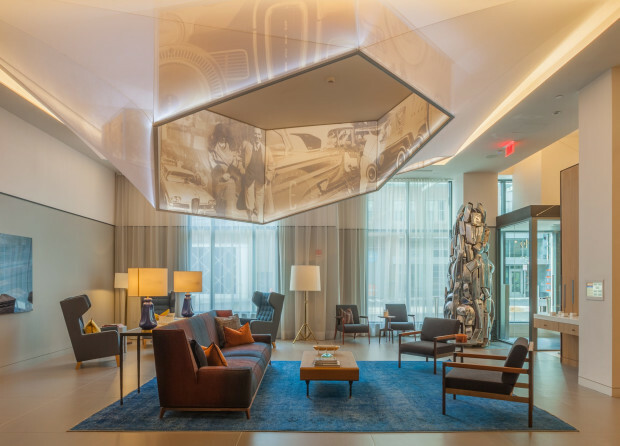 A single white stretch mesh fabric is secured around the entire soffit perimeter and the lower exterior of the three hexagons, leaving the interiors of the hexagons open to the lobby below. Strategically placed seams in the fabric in combination with taut aircraft cables between the hexagons give the surface of the mesh a faceted look. To the design team’s knowledge, nothing like this had been built, so Transformit began with prototyping various construction materials. They eventually settled on using a narrow aluminum extrusion for the frame. This extrusion could support the hexagon shapes and has channels ideally suited to Transformit’s “FasTen” attachment system for the tension fabric graphic panels. Transformit created 3D models and used a lighting program to test how the chosen approach would look in the space. Next, they built a prototype using the smallest hexagon shape at full scale. To achieve the varied angles of the frames, which was not possible with standard hardware, Transformit machined custom joinery. Transformit printed an approximation of the graphics using different saturation levels to test how they would look as seen from the front and reverse faces, with the light wash back-lit or on the front face, and when viewed directly or through the white mesh. The historical look that Planeta sought for the photographs was best achieved with the graphics printed and illuminated on the exterior face. The team also selected the saturation level such that the exterior faces, when viewed through the white mesh, had a light value comparable to the interior faces. Fitting the 20’ x 25’ tensioned mesh neatly and smoothly around the three angled hexagons required a hands-on touch. Transformit printed and laid out a full-scale ceiling plan on their shop floor, upon which they assembled the entire piece downside-up, positioning the hexagons in their precise locations on the “ceiling." One of Transformit’s stitchers then hand-cut and fit the mesh to the perimeter and hexagon frames much like a tailor fitting a bespoke dress or suit.